iCloud gives you 5.0 GB of free storage, but you may quickly exceed that. 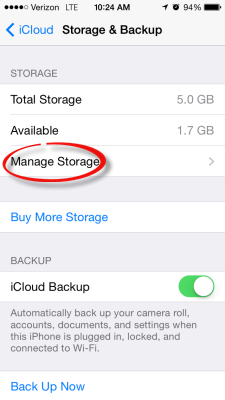 You have the option to purchase more storage, or manage the data that is stored in iCloud. Step 1:Open the Settings on your device. 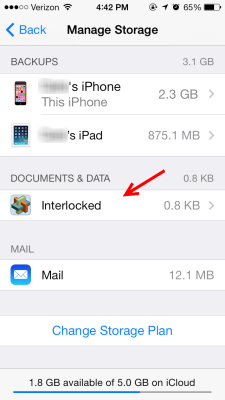 Step 3:Scroll down and tap Storage & Backup. Step 4:You will see the storage you have available and the option to buy more. 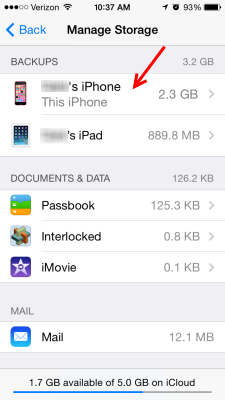 Tap Manage Storage to see what data is stored in iCloud. 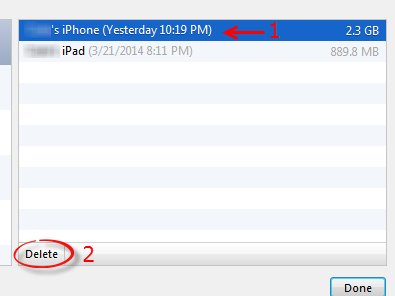 Step 5:The device backups are listed first. 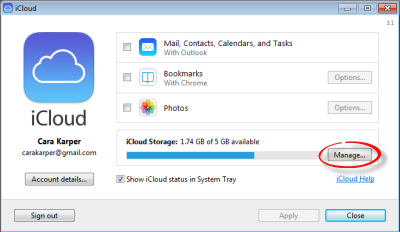 This is usually what consumes the most space, as it includes everything on your device that you choose to include in the daily backup. 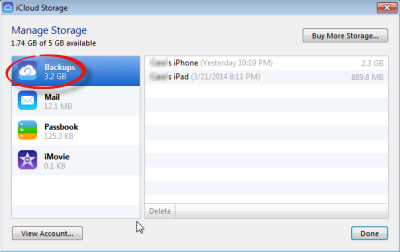 Tap on the name of the device you are currently using to manage the backup options. 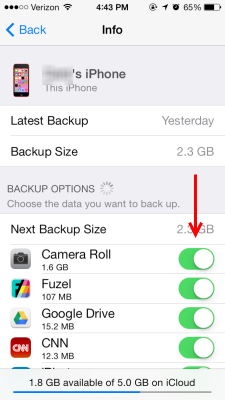 Step 6:You can choose to exclude certain app data from the backup by toggling them off (most are automatically backed up after you install them). 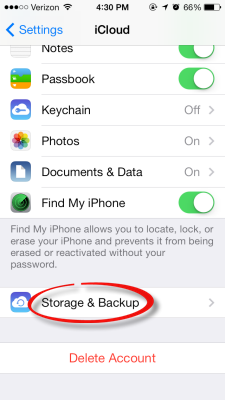 This will open more space in your storage, but turning any app backup off can result in that app's data loss if anything happens to your device. 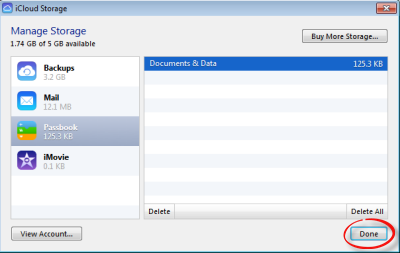 Step 7:Press Back to return to the Manage Storage screen. Step 8:Documents & Data are listed next. 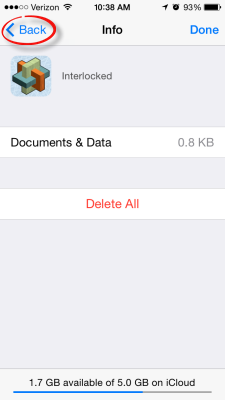 Select any App to delete its data. Step 9:On the App Info screen, tap Edit in the upper right corner. 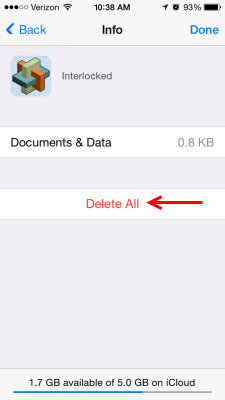 Step 10:Select which information to delete, if there is more than one piece, or tap Delete All. 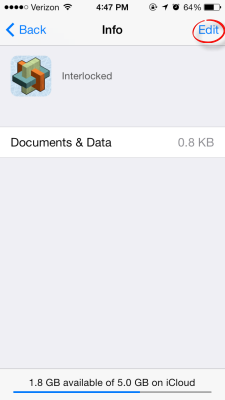 Step 11:Press Back to return to the Manage Storage screen. Step 12:Mail is listed next. 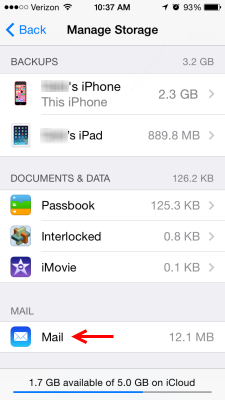 You will see how much space the Mail app is occupying, but you must delete messages in the Mail app to free any space. 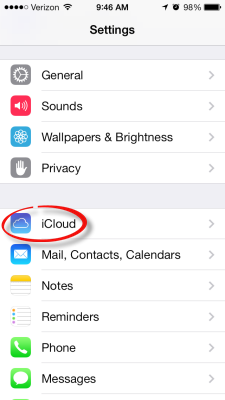 Step 1:Open the iCloud Control Panel. 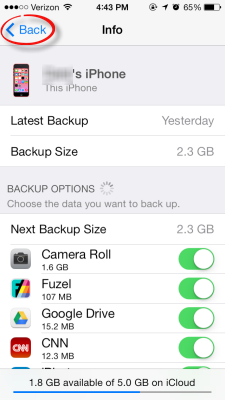 Step 3:Choose Backups on the left to view the backup storage. You will be able to see the amount of storage that the backup(s) take, but you will have to manage the individual app storage from the device itself. 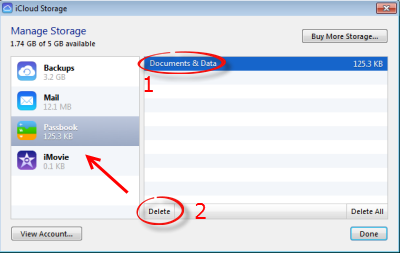 Step 4:To delete a backup, select it from the list and click Delete. 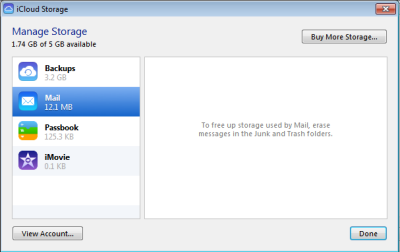 Step 5:You may see the amount of space that Mail occupies, but you must manage the mail storage from the device. Step 6:Documents & Data are listed next. Select an app to view and delete its data. To delete a data file, select it from the list and click Delete. Step 7:Click Done when you are finished.